If this is a new term for you, epoxy is the final product made of epoxy resins, which is a type of strong glue used for sticking things together and covering surfaces. In other words, it is a name for a type of a strong adhesive used for sticking things together. Usually, two resins must be mixed before being used. In this article, Barefoot Surfaces will answer some of the most-asked questions about epoxy floors. If you are located in Arizona, and you need to contact an epoxy contractor, don’t hesitate to reach us at our contact information to resolve any doubts you may have. What type of Epoxy Floors are there? We offer different types of epoxy floors that have a solid color, light or heavy color, chipped floors and some with a complete granite flooring. Every product that we present and install comes with a topcoat finish that makes everything look more gorgeous and have a longer lifespan. Is there any preparation before installing a floor? Yes, before starting anything, we prepare the concrete to be used for the installation process. While we are doing the magic mix, we thoroughly inspect every section of the floor for any oil stain that needs to be removed using degreasing products, while also repairing minor cracks that we may find on the surface. After everything is done, we start with the installation of the new epoxy floor. It all depends on the size of the space we are going to work on, and also varies by the choice of the floor material. It can demand from two days up to three days depending on the floor material on an average garage size floor. We also apply garage floor coatings in Queen Creek to make it last a lot longer. After the installation, do we have to wait before we start to use the area? Yes, there is a waiting period before the area is usable again. Epoxy floors need 24 hours but we strongly suggest to wait 48 hours before moving heavy furniture on it. If you need assistance with more information about it, give us a call. Barefoot Surfaces is always ready and happy to help you with anything. So I can park my car after waiting 48 hours? Cars are extremely heavy, so we recommend to keep all vehicles away from the garage floor coating for a minimum of five days, allowing time for it to completely dry. If you bring any vehicle before this time, it will cause serious damage to the epoxy floor, making you have to contact us again. What can I do to avoid having a slippery floor? Well, the finished surface is going to be a lot smoother than concrete, so the epoxy floors in Queen Creek will tend to be more slippery when wet than usual. In this case, we recommend you to clean your epoxy floors with an ammonia solution with water instead of a soap based cleaner to lessen the slippery situation. You can contact your local epoxy contractor for more information. Can I know how long does the floors last? If properly maintained, an epoxy floor can last up to 10 years or more. Barefoot Surfaces guarantee the best since we were founded with love for quality workmanship, paired with affordable pricing and great customer service. Our product represents us so we take the floor coating and staining process very seriously. We assure you that your epoxy floor will last for incredible amounts of time. Why is an epoxy floor a good choice? These floors are smooth and have a seamless surface making the floors easier for cleaning and it does not allow the accumulation of dirt and bacteria. It also provides a very appealing look since it’s glossiness makes the room look bigger and attractive than other floor materials. If you are not sold yet on epoxy floors and want to find more information about it, don’t forget that we are here to answer every question you have. 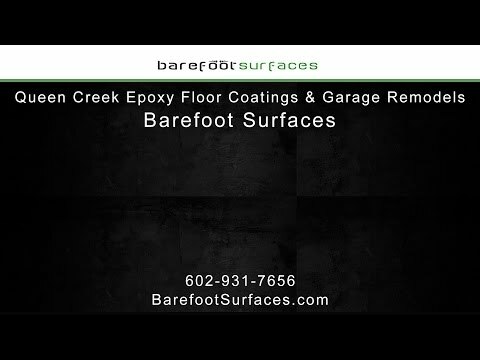 In Arizona, Barefoot Surfaces is the epoxy contractor in Queen Creek that guarantee to offer beautiful, durable floors that will bring value and protection do your home for more than a decade. We also offer outdoor epoxy floors in Queen Creek, so don’t hesitate to give as a call with any inquiry, we are more than happy to assist you.